In 1929, the Danish researcher Henrik Dam first noted that absence of one vitamin in chicken causes bleeding. In 1935, Henrik Dam named the coagulation Vitamin Vitamin K from "Koagulations-Vitamin". In 1939，pure vitamin K1 was first extracted from alfalfa by Henrik Dam;Drs.Doisy and Fieser extract vitamin K2 from fish. In 1943, Dam and Doisy shared the Nobel Prize in medicine for their discovery of vitamin K.
Vitamin K2 has various derivates.The most common forms are synthetic vitamin K2 as menaquinone-4 (MK-4) and natural vitamin K2 as menaquinone-7 (MK-7). It is of great importance to bone and cardiovascular health. 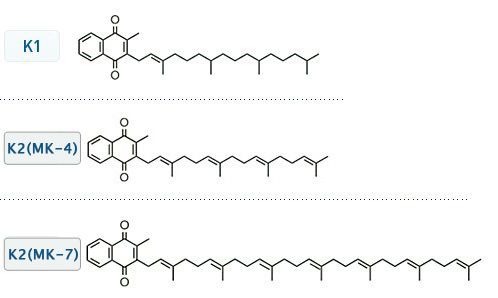 All K vitamins are similar in structure, but differ in the length of the "side chain". The longer the side chain, the better effect and efficiency. Consequently, the long-chain menaquinones (especially MK-7) are the most desirable as they are nearly completely absorbed (body requires smaller doses) and stay in the blood for the longest time. November 14th 2008 was a milestone for the development of vitamin K2. The European Food Safety Authority (EFSA) then published the positive scientific opinion on vitamin K2, MK-7 from natto as a dietary supplement and food ingredient. In 2009,The European Food Safety Authority (EFSA)published the positive opinion to demonstrate causality between the dietary intake of vitamin K2 and the normal function of the heart and blood vessels. Then Vitamin K2, MK-7 from natto have been authenticated as new resources food. According to the data from WHO,the long-chain menaquinones(especially MK-7)are considered the best vitamin K2. The safety and function of Vitamin K2 (MK-7) has been approved by FDA. 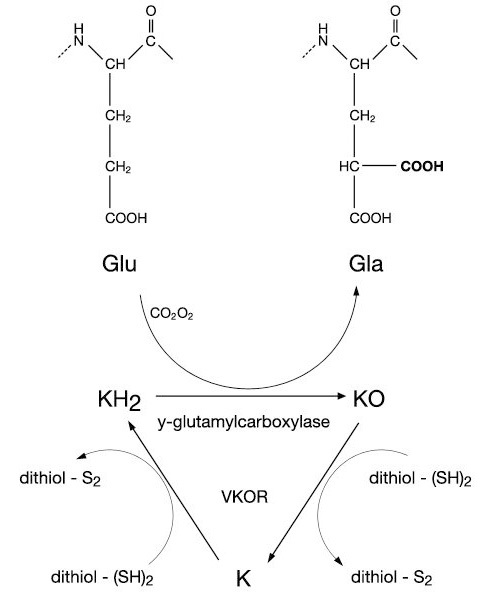 Carboxylation reaction -- "A cycle of Vitamin K"